Amsterdam, you are a pretty little thing. Your canals, your streets lined with beautifully green trees. Just so lovely! 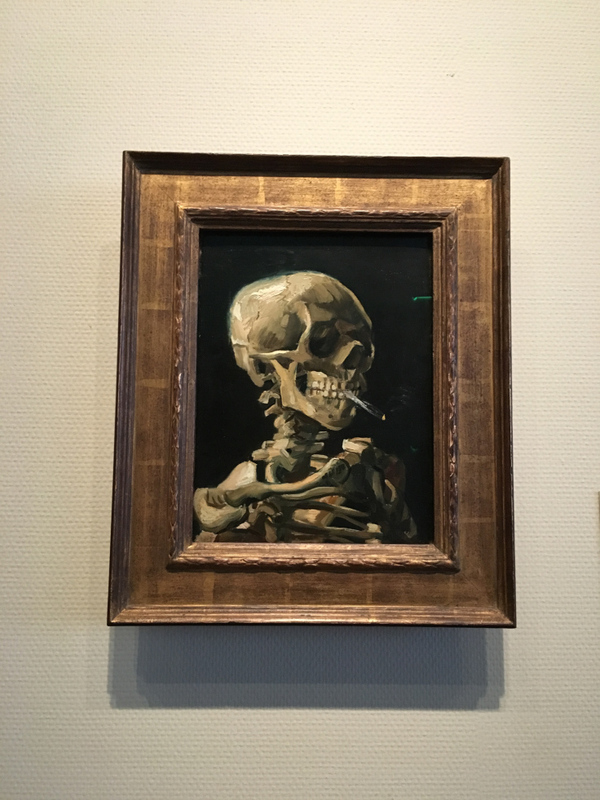 I really enjoyed my time in Amsterdam, it was a bigger more touristy city than Utrecht, where I spent a night before coming to Amsterdam for three. I got so many photos of canals, that I can't justify just putting every single one of them in the blog without everyone getting sick of seeing water running through a city! But as you can imagine, or if you've been - it's pretty awesome walking through a city built on water - just like Venice. 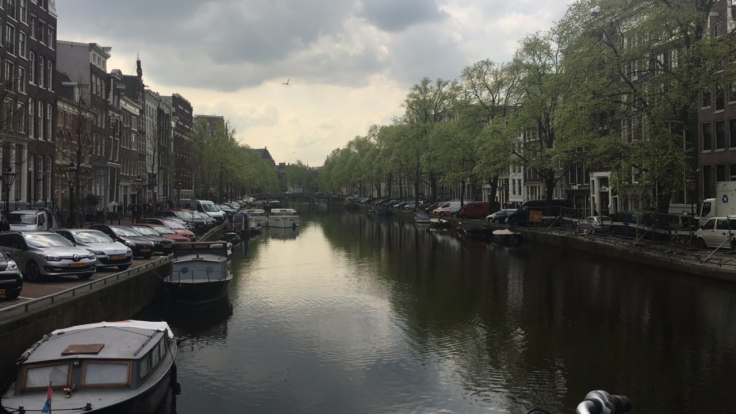 I enjoyed walking through and seeing the canals in Amsterdam more than I did Venice, it might be the size of the canals here, they are larger and filled with a lot more greenery. Green everywhere (including the "green" stuff). As usual, the Sandemans free walking tour was great! I wanted to do the bike tour, but they were all booked out :( boo. Showing us all the history behind a city that predominantly was left untouched during WWII other than the Jewish Quarter (they ripped it to shreds to get wood for burning when they ran out of fuel). What the difference between a coffee shop and a "coffee shop" is and getting told off by another shop owner while explaining a "coffee shop" full of smokers inside and outside. (I didn't get a picture, although the girl sitting outside I'm sure took a snapchat of all of us standing outside of it). Smelling weed quite frequently throughout the city was the weirdest part for me. I don't like the smell of weed, so it was very noticeable! Particularly on the front steps of the supermarket opposite Dam Square. Amsterdam is beautiful, I love the architecture of the buildings, the houses, skinny townhouses that mostly look exactly the same on every street so it makes it hard to know where you actually are in the centre of the city. It's crazy to think that during the era where catholic worship was forbidden, a standard Amsterdam home was converted into a hidden catholic church... that could fit up to 400 worshippers inside!!! The one with the girl standing in front of it... maybe she's going to church? Want to see the skinniest house in Amsterdam?? That still serves as a house today? Whose current occupants are two males and a dog who is almost as big as the house is wide! Sooooooo small and skinny! Tiny house anyone?! 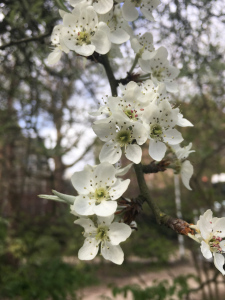 One hidden beautiful gem in the centre of Amsterdam's 'publisher' area, was the hidden garden 'Begijnhof', originally the sanctuary of the "Beguines" sisterhood, now houses older single woman. You can come into this little garden and just sit and take in the peace and quiet. 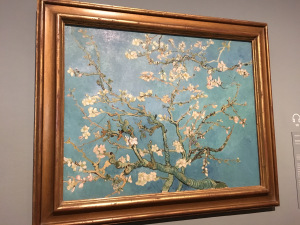 Museums, I am not a massive museum person and have only attended a few on my travels so far - especially on beautiful days, I don't like spending hours inside when I could be wandering a city and enjoying parks! 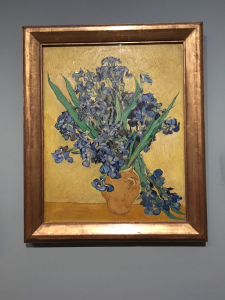 However, I did attend the Van Gogh museum and I was NOT disappointed! Before getting in there though, I stumbled on the 'I amsterdam' sign - when I say "stumbled", I didn't literally stumble over a big sign, I came across it, not knowing it was where the museum quarter was and the Art Square Amsterdam. 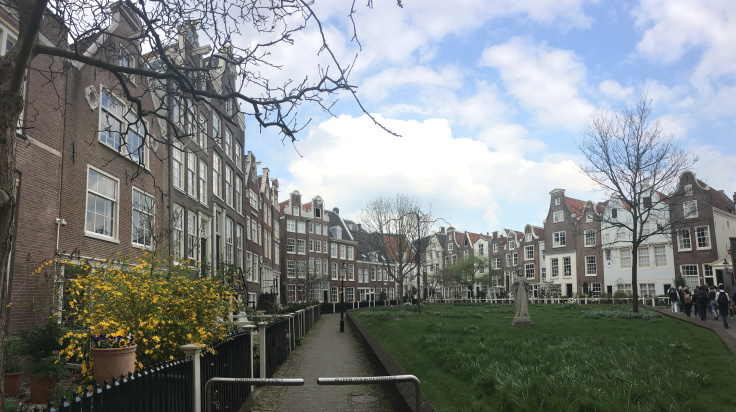 Such a beautiful square to have in front of Amsterdam's main museum with yet another massive park in the area too. I wanted to attend the Ann Frank House but the online tickets are sold out for the next two months and the line was over 4 hours long each afternoon. They open the doors from 3pm and you can wait in line to get a ticket. If you're planning on going to Amsterdam and want to see the Ann Frank House, book as soon as you know your dates!! 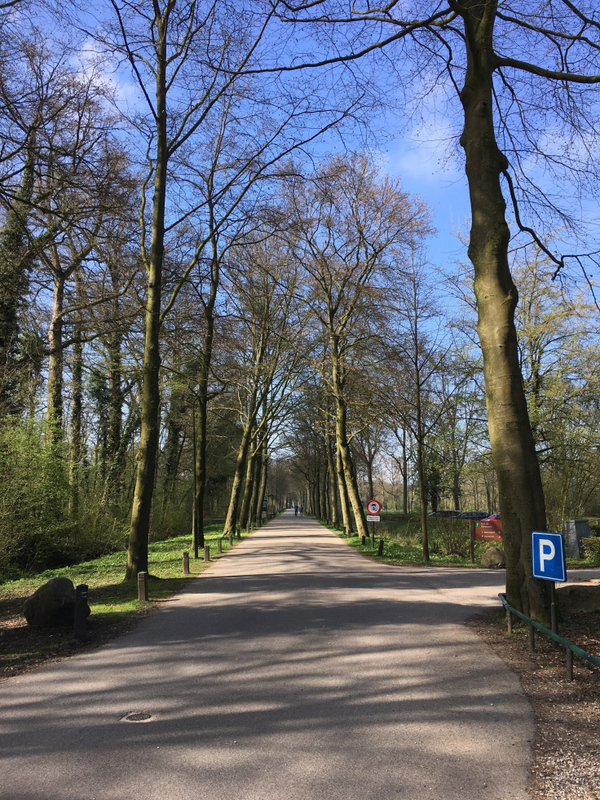 After museum fun and a delicious salad dish from SLA (highly recommend if you're in the Netherlands, absolutely devine), I made my way to Vondelpark, recommended by a friend and it was so gorgeous!! It use to be a park only for the rich, but now is maintained so beautifully that all can enjoy it at any time of the year! I don't have photos of my Red Light District tour, but I would recommend it! 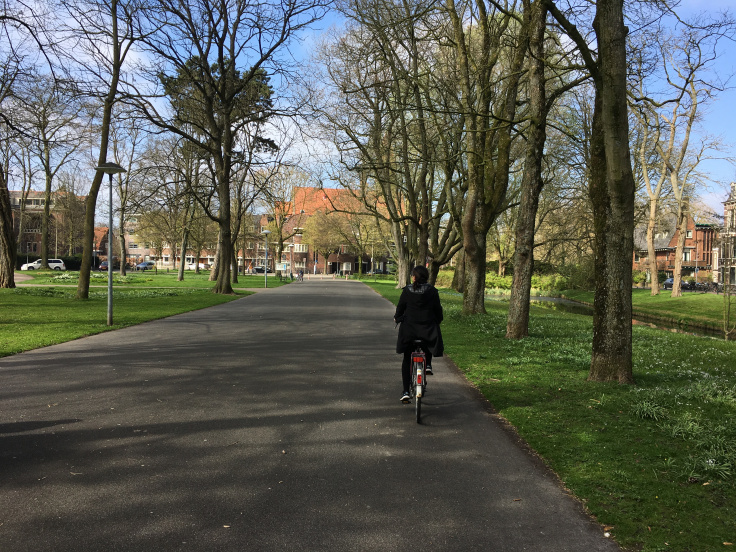 If you are a solo female traveller, the Sandemans tour is a great way to experience the district without having to feel you have to walk around it by yourself. Because daylight savings just ended in Europe, it was still too light for a lot of the action to have started. The guide gives you a good overview of why the district started, why it's still around and how much as a business person you'd make while working in a window. It was the oddest feeling walking through small streets and seeing woman standing in windows in next to nothing waiting for patrons to buy what they are selling. There was a family on the tour with two kids of about 16 and 18 and it was funny watching the mothers expressions change as the tour guide talks about hand and blowjobs. Haha! 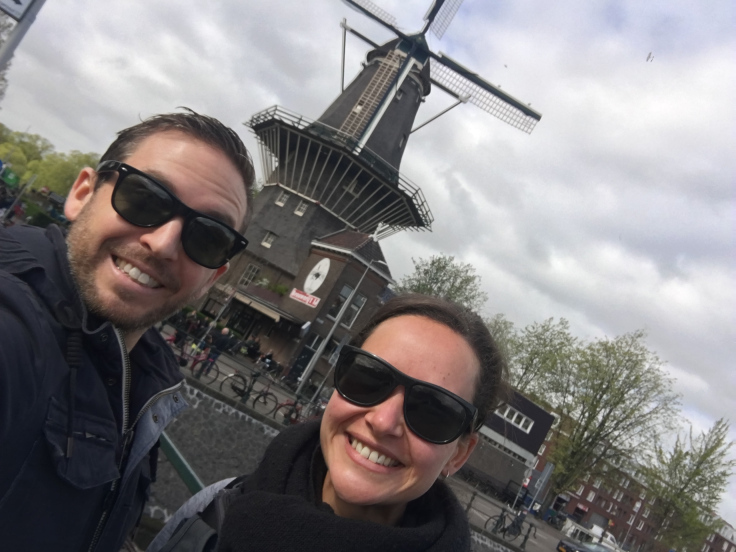 My final day was spent sleeping in, lounging around, planning my trip to Barcelona and then meeting up with an old friend from New Zealand for a beer tasting at one of the best beer tastings in Amsterdam - Brouwerij 't lJ. I didn't do the Heinekin Brewery Tour as I wanted to do something a little different and this was such a good time! An Australian started chatting to us with his Dutch girlfriend and two hours later we were well into having a good time. I would definitely recommend!! I can't remember at all what they were! But the middle one was my favourite! Oh and a place I shouldn't forget to mention - get to the FoodHallen - it's a great place filled with different food stalls which will appeal to everyone - I must have deleted the photo I took, but they have a beer bar and a Gin bar! Amsterdam is a great city and one definitely worth seeing and experiencing (all of it if you are so inclined). There is so much to get up to! 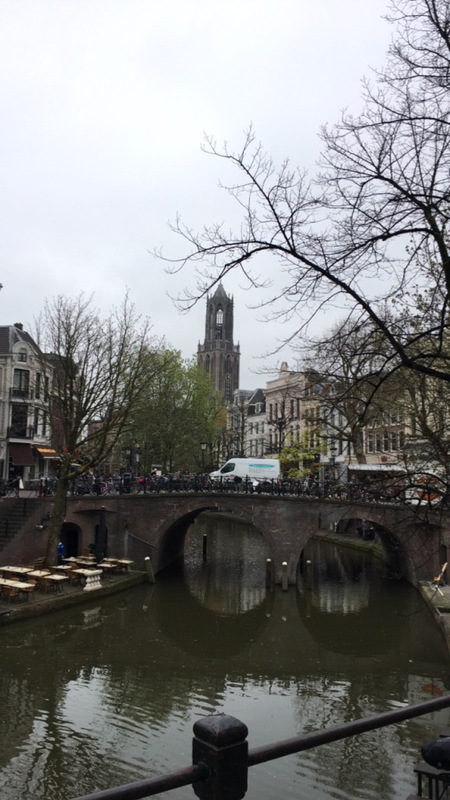 Buuuuuuut, if you want to get away from the touristy side of Amsterdam, you should definitely head to Utrecht, which was incredible! Just a 30minute and 9.80€ train ticket, you can experience the beauty of another Netherlands city also with beautiful canals. 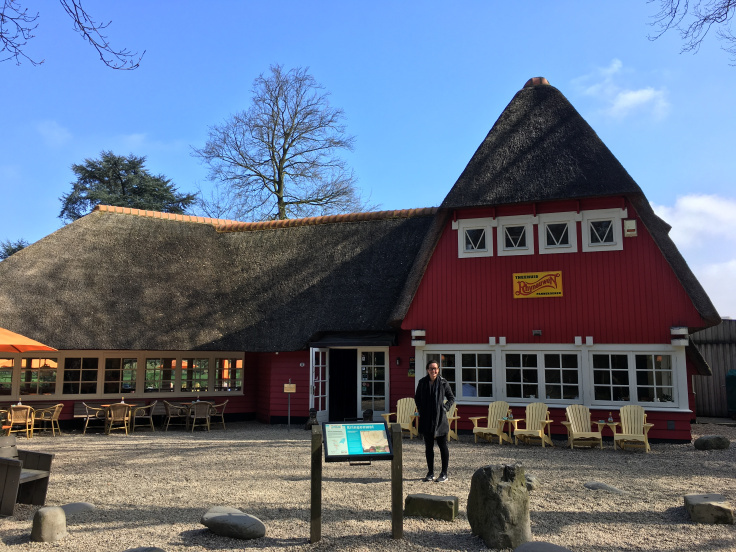 Just 10mins bike out of the city and you're in beautiful countryside on your way to a delicious pancake house! Such a stunning place! A must see!